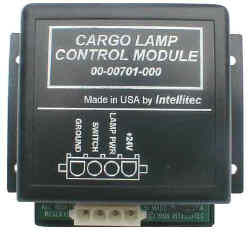 Intellitec’s Cargo Light Control/Encapsulated (CLC/E) is designed to control the box lights on service vehicles. It is easy to install, provides multipoint switching and used momentary switches in parallel to turn the lights on and off. Two switches are used, one to turn the lights on, and another to turn them off. In addition to this convenient on/off function, the CLC/E offers battery rundown protection from the lights being accidentally left on. If the lights are left on for more than twenty minutes, the CLC/E will blink the lights at a rate of eight times per minute alerting the driver of an impending shut off. After the eighth blink, the lights will automatically be turned off, preventing further run down of the battery. If the driver wants to keep the lights on, he simply turns the CLC/E off and on again, allowing another twenty minutes of use. The CLC/E also includes low battery indication. If the battery voltage falls below 12 volts for a period of two minutes while the lights are on, the lights will blink the eight times per minute and then shut off. The Cargo Light Control/E is a water proof module, suitable for harsh environments. The electrical connections are made with a PackardWeather packconnector.